Cecropia’s web site has a new look. Because Cecropia has a new direction. After many fruitful years of experimenting in the fascinating laboratory of coin-operated video games, we have decided to leave the coin-op world behind us. It is a new millenium. We are focused on the Internet. The Act taught us a lot about creating an emotional connection between game players and interactive characters. That connection can be a powerful force. We think the best place to apply it now is in interactive advertising. Yesterday, I saw Nintendo’s creative superstar, Shigeru Miyamoto, deliver the keynote address at the Game Developers Conference in San Francisco. His name is unknown to the masses of non-video game fans. But among gamers, he is revered almost to the point of worship. The whole speech was great, but the best part was a fascinating glimpse into his personal life. Miyamoto spoke about his wife, who had long held an aversion to video games. His wife did not even care for the wholesome and broadly appealing games of his own design. He came to use his “wife-o-meter” as the ultimate test of broad appeal. Even Tetris, famous for its popularity with women, scored a zero on his wife-o-meter. When their daughter began playing Zelda: Ocarina of Time, a turning point occurred. His wife put aside her distaste in order to observe and monitor. Later came Animal Crossing, and Mrs. Miyamoto first agreed to touch the controller. Then came Nintendogs (the Miyamotos have a family dog) and finally, Brain Age, and Mrs. Miyamoto became truly interested. And then today, of course, we have a Wii in our house. So last month, on the 14th, Valentine’s Day (in Japan on Valentine’s Day, women give chocolates to men—it’s very nice). So as usual, I came home rather late from work, and I expected her to be asleep. But I opened the door, and I heard the sounds of the Wii. So of course I thought “Oh, she waited up! Just to give me chocolates! That’s so sweet!” But actually, she was just casting her votes on the Everybody Votes channel. But here’s the amazing thing: what this meant is that she herself used the Wii and downloaded the Everybody Votes channel all on her own. This is an incredible occurrence in my household. Like—it would be more normal for me to walk home and find Donkey Kong eating at my dinner table. So now, things have really changed at my house. Many people (including this group of passionate Dragon’s Lair fans) have asked how The Act compares to the fabulous Dragon’s Lair, Space Ace, and the other animated laser disc games of the 80’s. I love being mentioned in the same breath with these legends of video game design. I like to think the artwork of The Act is similar to the artistry of Don Bluth, Gary Goldman, John Pomeroy and other ex-Disney greats who created the beautiful artwork of the Dragon’s Lair series. However, Dragon’s Lair‘s interactivity was limited by its optical disc technology (and the high cost of RAM at the time). The Act, by contrast, allows direct control over a character—more like Donkey Kong than Dragon’s Lair. The Act‘s biggest innovation is that the player’s direct control is not over physical actions like running, climbing and jumping. Instead, you control emotional attitude like coaxing, flirting, and bullying. The gameplay of The Act revolves around the same thing that makes the story interesting: the relationships and emotions of its characters. In developing The Act, we experimented with many different graphical styles including CGI and machinima. We even tried video taping live actors. However, it wasn’t until we met Anthony Michaels, Broose Johnson, Barry Temple, Sasha Dorogov, and all the other awesome veterans of Walt Disney Feature Animation’s Orlando studio that we began to achieve the level of acting required to make the “emotional gameplay” work. My kids got Katamari Damacy for Christmas. So now, my wrists are killing me and I can’t get that song out of my head. Last night we went to a furniture store. Katamari fans will understand that I caught myself staring at a sea of dining room sets with a silly grin on my face. I think the last time I had it this bad for a video game was Snake Byte on the Apple II. 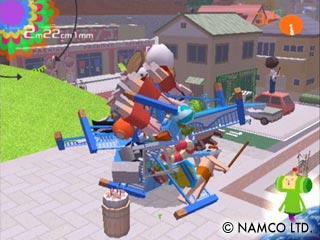 Title: Katamari Damacy; Platform: Sony Playstation II; Publisher: Namco; Rating: E (Everyone); I highly recommend it. The Portland Press Herald reports that one of my favorite places, Baxter State Park in Maine, has just expanded its borders by acquiring a key, adjacent parcel of land. The puchase was funded by the charitable contributions of hundreds of individuals, corporations and foundations. The 200,000 acre park is unique among state and national parks in the United States. Most other parks, including all National Parks, are managed with the express purpose of enabling human enjoyment of the land. Baxter State Park is managed under the guidelines of a trust written by the late Percival Baxter. The rules are clear: the park is for the wildlife, and human visitors are barely tolerated. The trust keeps the wilderness pristine, and the experience of visiting it difficult and humbling. Attendance at the park has been declining steadily since 1996. Studies have shown that all wilderness recreation has been suffering, due in part to gasoline prices, but also because of—God help us—video games. Despite the fact that making video games has been my livelihood for the past 24 years, I think it’s a shame that the appeal of video games has taken away from people’s desire to experience the wild. The human race has been around for 250,000 years—human civilization only 13,000. I enjoy Baxter State Park, because there I can be in touch with what the world was like for the first 237,000. It helps me keep things in perspective.